I'm legit surprised we aren't down by 30 with how God awful they looked. Entire starting lineup should be absolutely embarrassed. LOL ...Luka doesn’t touch the ball but DSJ, DJ and Wes ofcourse manage to F it up. Wes is so dumb sometimes. You see Westbrook creeping behind DJ and you throw that pass anyway. Refs will make sure it doesn’t get this close again. Just wait..
Last edited by Melonhead; 12-31-2018 at 09:45 PM. Well Ricks gonna use at least 3 more timeouts even with none left. 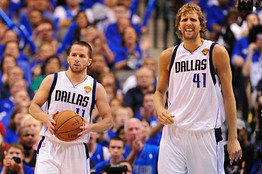 If I Was Luka I would be so frustrated at time playing with some of these guys. Even when he doesn’t play great he digs us out of a hole and they just throw it all away. Not a fan of Carlisle's defense. I think his time has past. I mean, I'm seeing guys constantly going under screens, not in position to guard open players, not putting hands up against shots. Frustrating to see. Lol, "kicked in the Gortats" is never gonna die. Hopefully we can keep it under 15 and Luka will give us a chance. He is hot, I give you that. . Wow, he's on fire.